DENVER – Opioid-related deaths fell by more than 6 percent in Colorado in the two years after the state started selling recreational marijuana, according to new research published in November’s edition of the American Journal of Public Health. The researchers who conducted the study found the 6.5-percent reduction represented “a reversal of” a 14-year increasing trend in opioid-related deaths in Colorado since 2000. But they stressed in the report that further research is needed in order to make sure the trends could be seen beyond Colorado, as there aren’t any other states that had a similar timeframe for legalization that could be studies. The use of marijuana as an alternative to opioids, or as a recovery tool for addicts, has been much-discussed over the past year, as more states have legalized either medical or recreational pot, and as the Trump administration fights the notion that marijuana could be a helpful alternative medicine. Several studies have shown that medical marijuana has been beneficial to opioid users . A study published last year by researchers at the University of Michigan found chronic pain sufferers who used cannabis saw a 64-percent drop in opioid use. And another study from the Journal of the American Medical Association found that yearly overdose deaths involving opioids were close to 25 percent lower in states with medical marijuana programs. But the Colorado Substance Abuse Trend and Response Task Force released its 11th-annual report in January, which says that age-adjusted heroin-related hospitalizations have increased by 41 percent from 2011 to the end of 2014. And Colorado as a whole saw a 756 percent increase in deadly heroin overdoses from 2001 to 2016, while heroin seizures by Colorado law enforcement agencies increased by 2,035 percent from 2011 to 2015. But Colorado is also using some of its pot money to open opioid-treatment programs across the state. 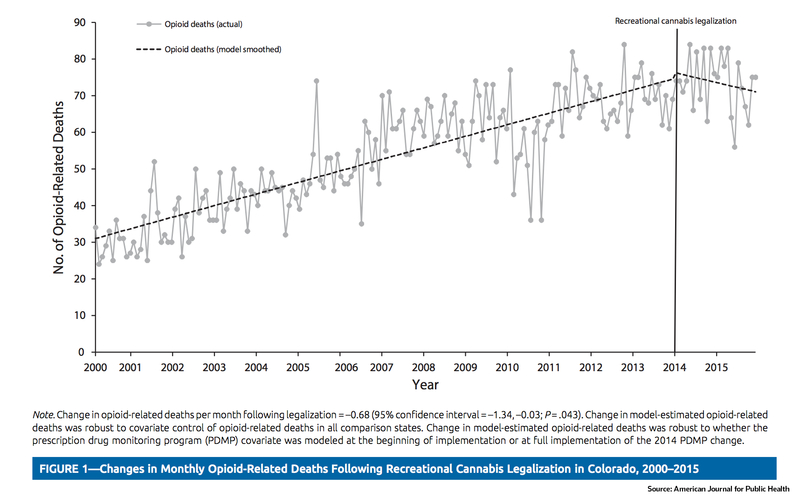 The study published in November’s AJPH by the researchers from the University of North Texas, University of Florida and Emory University, took a look solely at Colorado’s recreational program and its correlation with opioid-related deaths. Since there were few points of comparative reference for Colorado’s legalization timeline, the researchers worked to strengthen their model by comparing Nevada and Colorado, since Nevada legalized medical marijuana shortly after Colorado did, but did not legalize recreational marijuana until the beginning of 2017, after the study had been completed. And the researchers wrote that they tried to account for a 2014 change in Colorado’s prescription drug monitoring program, which required those prescribing the medication to register with the program but not necessarily use it. The researchers used data from the CDC and WONDER to put together a chart of opioid-related deaths in each month beginning in 2000, then model-smoothed the average and compared the number of deaths at the end of 2013 to the number afterward, through 2015. But they also warned that more research would be needed in the future. “Given the rapidly changing landscape of cannabis and opioid policy in the United States, the need for evidence of the diverse health effects of these laws is increasing,” the researchers wrote. “I’ve heard people say we could solve our heroin problem with marijuana. How stupid is that? Give me a break,” he said during his March speech, which again lumped together drug use and an uptick last year in violent crime. Sessions also in June sent a letter to lawmakers asking them to include language in the new budget that says marijuana can lead to “significant negative health effects,” to which the Scientific American responded with a strong retort. U.S. Sen. Michael Bennet, D-Colo., has questioned the administration’s “open hospitality to state policies” regarding legal marijuana. In May, he and a group of senators sent the Justice Department and DEA a letter suggesting they target deadly drugs, like opioids, rather than marijuana, which has never on its own caused a deadly overdose. “Particularly given the severity of the ongoing opioid use epidemic, federal resources should be targeted at providing comprehensive substance use disorder programs and cutting off the flow of deadly drugs rather than interfering with state regulatory regimes for marijuana,” the letter said. Gov. John Hickenlooper, a Democrat, and Attorney General Cynthia Coffman, a Republican, have both stood up to the administration’s push against legal marijuana programs in recent months. The administration has said it is still reviewing its policies.